While growing up scents of orange, cardamom and rose water would fill our home when my mother and grandmother baked a Middle Eastern cake that they served often with tea. The traditional cake is dense and eggy with a generous amount of walnuts and soft golden raisins. No matter what time of year, when this cake is in the oven, it smells like Christmas. Today, my grandmother tells me that the secret to her delicious version is to grind the entire orange in a food processor and add it to the batter; skins, pulp, juice and all. She also never skimps out on any of the sugar and eggs. We’ve had our differences in the kitchen! Let’s just say she doesn’t agree with taking the low calorie approach to desserts and likes to keep it real! I recently craved the flavors of the cake but changed it up by using the same ingredients and applying a modern twist. Moist cupcakes with hints of orange and cardamom topped with a vanilla rose water frosting and lots of crunchy walnuts on top is what I had in mind. My thoughts became a reality and they turned out just as I expected. Memorable flavors of my childhood converted into delightful mouth watering cupcakes! A visit to your local Middle Eastern or Ethnic Food Market is necessary to gather the ingredients for this recipe. If you are not familiar with rose water, it smells like heaven and adds an aromatic touch to some of my favorite desserts such as baklava and rice pudding. You will also find cardamom there, a sweet and citrusy pungent flavored spice. It’s best to buy the cardamom whole and grind the desired amount to a fine powder using a coffee grinder. I put the cardamom seeds in with the shell and sift out the chaff after grinding. 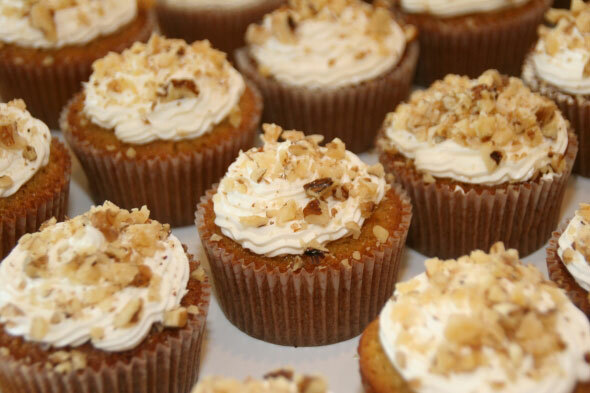 Before you leave the store, be sure to grab a bag of fresh walnuts, they will make your cupcake topping all the better! You can frost these cupcakes high and dip your finger in for tastes. The frosting amount is plentiful! Enjoy! The inviting scents of cardamom and rose water will make your mouth water for these delightful cupcakes! Treat yourself to one with your afternoon tea! Prepare Cupcakes: Preheat oven to 350 degrees with rack in the center. Line two 12-cup muffin pans with cupcake liners. Lightly spray with non-stick cooking spray to prevent tops from sticking. Sift flour, baking soda, salt and cardamom in a medium bowl, set aside. Combine orange juice and milk, set aside. In the bowl of an electric stand mixer fit with the paddle attachment beat the butter until soft. Add the sugar and beat until light and fluffy (about 2-3 minutes). Add the eggs, one at a time and beat until well incorporated. Add vanilla extract, rose water, and orange zest and beat until combined. Reduce speed to low, add milk/orange juice mixture and flour mixture alternately, beginning and ending with flour mixture, mixing batter until smooth, scraping down sides if needed. Using a ¼ measuring cup evenly distribute batter inside cupcake holders. Smooth tops then bake in the oven until toothpick inserted into the center of the cupcakes comes out clean, about 18-20 minutes. Remove from oven and allow cupcakes to cool. Transfer cupcakes to a wire rack to cool completely. Fill a piping bag with frosting and frost the cupcakes starting from the outside and working your way in to the center. Sprinkle tops generously with chopped walnuts. *Cupcakes keep well in an airtight container for 2-3 days or may be refrigerated. Bring to room temperature before serving.